For the next selection on the highlife turntable I have selected two tracks, Ewule Ko Ye and Soldier by Kojo N'dah off a Papa Disco release titled Kojo N'Dah. I do not have a lot of information on this performer. I first came across his name on a T.O. Jazz LP Welcome Ojukwu, where he was listed as a background vocalist. 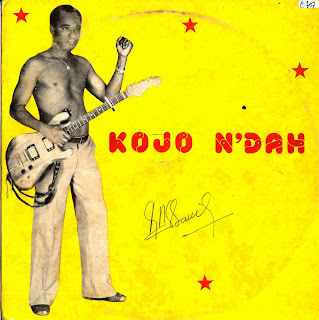 I liked his voice so I started looking for records by him, but the few records I was able to find had a pop Ghanaian sound that was not all that interesting. But these two songs really stood out for me as they showcase his vocals beautifully and have that driving uptempo late 70's Ghanaian guitar rhythm I really love. I think the Ewule Ko Ye track is a little tighter, but the Soldier track is longer and has several nice guitar stretches. I could not decide which song really did the man justice so I decided to post both tracks. I hope you like them. Thank you for the two tracks, I really like the second one ("Soldier"), it's been on non-stop today. Both tracks are really nice. Great stuff.